http://www.powerlineblog.com/archives/2016/07/finally-a-wapo-op-ed-that-backs-trump.php In which WAPO reacts to sustained criticism that they have long been in the tank. So, a peep out of them. Seems like we ought to have an Ogden column on all the sins of the Clintons. You know, just a peep or two...easily written, wealth of materials to choose from, hundreds of policies Paul would not like even if his current role is to help enable them. Sure, it isn't easy to be a conservative in Indiana or even in america when the liberals are in charge of sinking the ship. There are 15 or 16 candidates Paul would have preferred but none of them are going to be in a Clinton Cabinet. None of those 15 or 16 were capable of winning a national race....in the view of the great mass of Republican voters....whose views are not conservative in the main but Republican. Republicans are best viewed as a different species of slime. Their version of hypocrisy gives Hypocrisy a bad name. Buried in that slime pile are the conservatives...having been routed out of the Democrat Party (for the most part) by that latent yet powerful strain of Communist DNA stenching from FDR days. So, the R conservatives are not in charge of anything. But, the Republicans cannot win elections without them. Their course of action thus cannot be to alter the slime in which they swim but to cut a deal wherein their support translates into political promises....knowing full well that Republicans don't keep their word or their promises. Mewing after Hill's skirts and the return of Bill to the Intern office isn't what a manly conservative would do....it the the course of action for girlie men like George Will, et al. Pence has shown his mettle. It needs quite a bit more heat treatment and work hardening. He does not understand how representative democracy works and has no backbone against crony capitalists or any other capitalist running an amoral corporation. Folding like a cheap card table is not Presidential material or even Vice Presidential material. Sure, one has to write about something.....and polls are so yesterday....so why not pick on the bag lady in pantsuits? Please please please please please please! 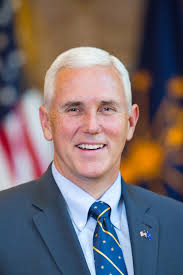 Remove Pence from any possibility of a second term! Pence would add nothing to the Republican Presidential Ticket. Indiana is going to go Republican. The Trumpet needs a VP from a swing state like Ohio, PA or FL. Flogger, I don't consider it a certainty that Indiana will go for Trump. Obama won Indiana in 2008 against a GOP candidate who was a lot more popular with Republicans than Trump. Trump is turning a lot of former Republican states into competitive contests. I would agree though if Trump has to worry about Indiana, then it's a moot point. While I support him here as the best option; economically, the Governor would be a low energy pick. In recent decades, Republicans have no record of reducing the size & expense (tax, fees, etc.) of government; in real net terms. Slow growth statism is BS; not a free market solution.